What’s most fascinating about My Neighbor Totoro is how it portrays the two young girls, who are allowed to just be girls. They are not one-dimensional “plot moppets”: they are giggly and irreverent, quick to temper and even quicker to forgive, prone to worry about the unknown as much as they revel in the relatively careless freedom of youth. In other words, just as delightful and complicated as children truly are. Totoro depicts that storied “magic of childhood” in both figurative and literal ways. The girls encounter spirits which, according to Nanny, can only been seen through the innocent eyes of a child, and when they tell adults what they have seen, they are not ridiculed or chided, but believed. 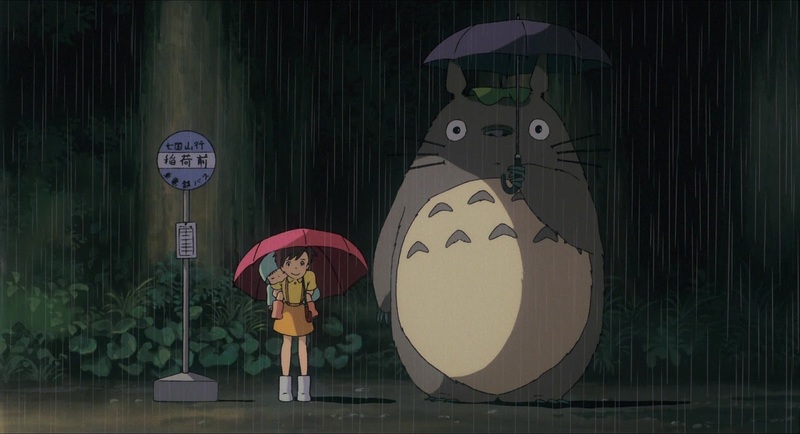 There’s no cynical twist to the story, no doubt that the girls’ experiences with Totoro are as real as the things that happen in their everyday lives. It’s ALL real, without question. And that’s part of what makes Totoro so very special, because it allows us to embrace that belief wholeheartedly and share a small bit of that magic. I love My Neighbor Totoro!! !